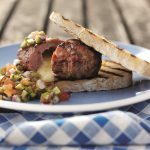 This recipe is delicious a great twist on the average burger, the cheese is a lovely combination with the rabbit and bacon. This will become a family favourite. Place rabbit, bacon and chives in a bowl. Season with salt and pepper then mix together so that all ingredients are well dispersed throughout. In another bowl mix the mozzarella and cheddar cheese together then divide the mix into 4 x 30g portions. Take each cheese portion and roll it into a tight ball, then flatten slightly so you have a thick disc shape, keep to one side. Now divide the meat mix into 4 x 150g balls. Dampen your hands with a very small amount of water and roll the meat ball in your hands to give the meat a smooth surface with no seams. Once you have a perfect ball, flatten it slightly to a thick disc burger shape. Repeat the process with the rest of the balls. Place all of them in the fridge to chill for 10 minutes. Brush the burgers with rapeseed oil and seal in a non-stick pan or on a griddle. Cook until you have a good seal on the outside of the burger then place in the oven at 180C/Gas mark 4 for 15 minutes. Meanwhile mix plum tomatoes, red onions, gherkins and coriander in a bowl and place in the fridge to keep cold. You need to add lime juice and seasoning to the mix at the last minute. 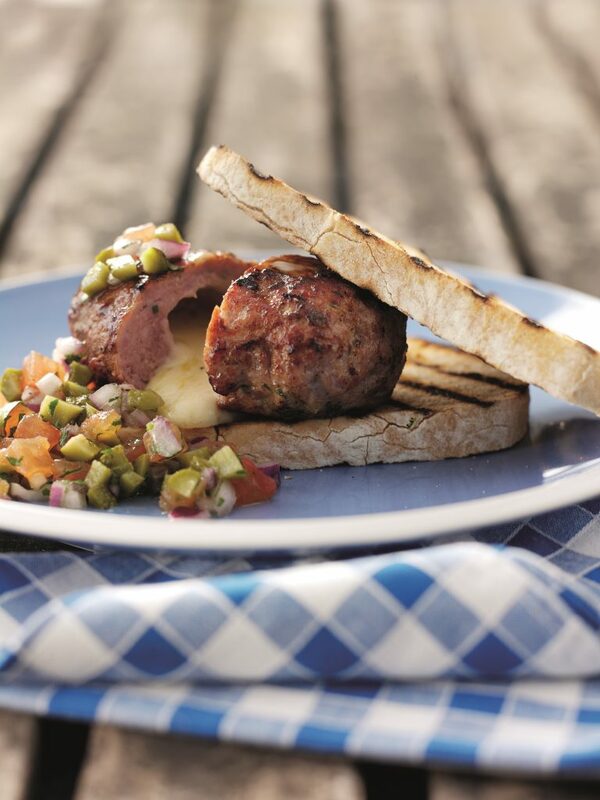 Once the burgers are cooked, remove from oven and allow to rest while you toast your soda bread or burger bun. You can do this by placing it on the griddle or in a toaster. To plate, place the bottom half of the warm bread or burger bun on the plate, then place the burger on top. Take the tomato and gherkin mix out of the fridge and add lime juice, season and mix, then spoon over the burger, topping off with another slice of soda bread or the burger bun.